That was a fish, once. Tuna specifically. Katsuobushi—repeatedly smoked, fermented fish—holds the record as the hardest food on earth, bearing more in common by the end of its processing to petrified wood than to sealife. Who would eat such a thing? Well, you, probably. When shaved into more manageable flakes it’s an essential ingredient in dashi, the Japanese stock that makes the basis for miso soup, among other foods less familiar to Western take-out customers. 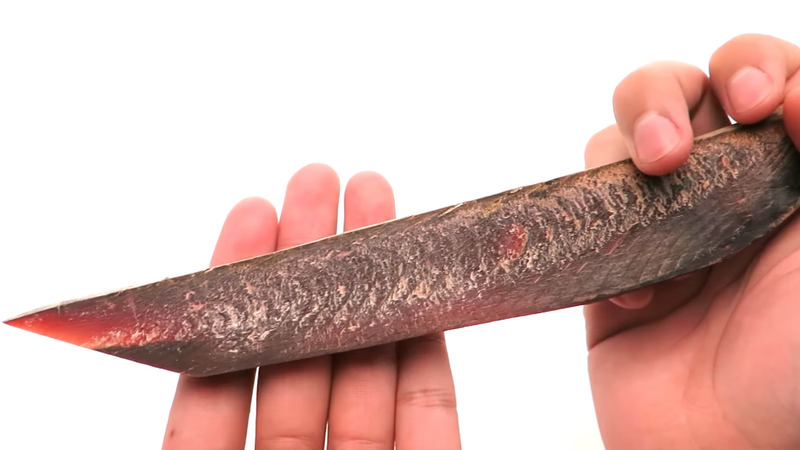 It’s also durable enough that one YouTube knifemaker shaved (and shaved, and shaved) a whole chunk of the stuff into a reasonable viable, if uncomfortable blade. The shavings and dust were saved for what I’m sure will be many delicious future meals, hopefully none of which will be prepared using this ridiculous blade.